UPDATED APRIL 14TH 2017: Added new Emily cover version. Click here to view last year covers featuring Kylie Jenner, Nicola Peltz, Ellie Goulding, Gugu-Mbatha Raw, Zendaya and Hailey Baldwin, here to view 2015 covers featuring Felicity Jones, Zoe Kravitz, Hailee Steinfeld, Kate Upton and Iggy Azalea, here to view 2014 cover featuring Lupita Nyong’o, Elle Fanning, Emilia Clarke, Elizabeth Olsen and Kate Mara, here to view 2013 cover featuring Scarlett Johansson, here to view 2012 cover featuring Zooey Deschanel, here for 2011 covers with Lea Michele, Amber Riley and Dianna Agron, and here for 2010 cover with Jessica Simpson. The 27 year old American singer is featured on the February cover of Elle Canada. Clich here to view last year cover featuring Kate King, here for 2011 cover with Dianna Agron, and here for 2010 cover with Charlize Theron. Check out Covergirl cosmetics’ latest campaign images featuring their latest additional spokespeople for this year (Pink and Janelle Monae) and their renewed contract campaign stars (Queen Latifah, Sofia Vergara and Taylor Swift). 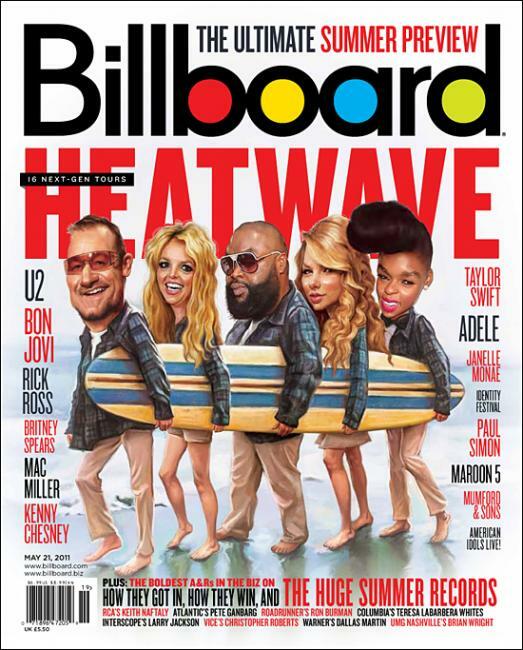 The latest cover of Billboard magazine features Bono, Britney Spears, Rick Ross, Taylor Swift and Janelle Monae in a Beach Boys pose created by Design Director, Andrew Horton.